1965 yielded Ayler treasures as well as his style shifted. The transitional Bells was just under 20 minutes, released originally as one side of a clear vinyl LP with the other side empty of music. It was recorded at a May 1 Town Hall concert of ESP artists, displaying Ayler's new group. Murray remained, Albert's brother Donald joined on trumpet, and Lewis Worrell held down the bass slot. The denser sound of "Bells" shows Ayler moving towards the bigger sonic statement made on Spirits Rejoice, his September 23, 1965 Judson Hall session. By the way, "Bells" as heard here is not, in fact, a single composition; rather, it is a medley moving from "Holy Ghost" to an unnamed theme and then into "Bells" proper. Bernard was so excited by "Bells" that it was released on one side of an LP without delaying to record additional music to fill the other side. 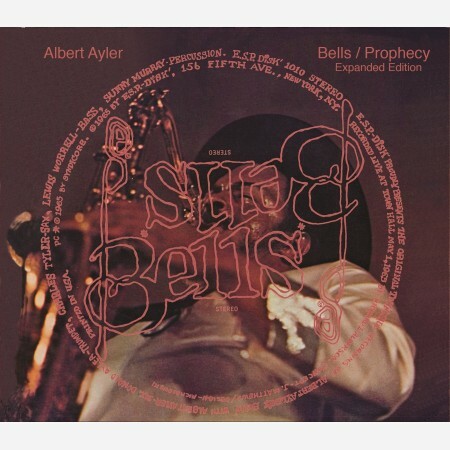 "Bells" also happens to be the recorded debut of saxophonist Charles Tyler, who would go on to record for ESP as a leader (ESP1029, Charles Tyler Ensemble, and ESP1059, Eastern Man Alone). 1:1: Albert Ayler, tenor saxophone; Donald Ayler, trumpet; Charles Tyler, alto saxophone; Lewis Worrell, bass; Sunny Murray, drums. Recorded live at Town Hall, New York City, May 1, 1965. 1:2-6, 2:1-6: Albert Ayler, tenor saxophone; Gary Peacock, bass; Sunny Murray, percussion. Recorded live at Cellar Café, New York City, June 14, 1964. All compositions by Albert Ayler (Syndicore Music BMI).